Lately, there has been an increased incidence of late stent thrombosis; especially following Drug eluting stent (DES) implantation. Several factors are associated with an increased risk of stent thrombosis, including the procedure itself, patient and lesion characteristics, stent design, and premature cessation of anti-platelet drugs. We present a case of late stent thrombosis (LST) following DES implantation after a period of 68 months, making it the longest reported case of LST reported in the literature, despite the use of dual anti-platelet therapy. Several randomized clinical trials have shown that implanting Drug eluting stents (DES) result in clinically significant reductions of in-stent re-stenosis compared with Bare metal stents (BMS) [1, 2]. However increased risk of Late Stent thrombosis (LST) is more pronounced 6 months to 1 year after DES implantation, compared with BMS [3–5]. The benefits of lower rate of in-stent re-stenosis versus the risk of in-stent thrombosis is paramount in the decision making process especially when faced with a patient requiring emergency stenting. In-stent thrombosis is a much rarer event than in-stent re-stenosis but results in mortality rate of up to 45% and a nonfatal infarction rate of another 30% to 40% [6, 7]. Our patient experienced very late stent thrombosis, occurring 68 months post DES implantation, making it the longest time-to-event, reported in the literature. A 75-year-old Caucasian gentleman had presented to our emergency department 5 years and 8 months ago (2003) with chest pain secondary to anterior wall ST-segment elevation myocardial infarction. His past medical history was significant for hypertension and dyslipidemia with a 50 pack years smoking history. Dual oral anti-platelet therapy with aspirin and clopidogrel along with intravenous heparin were administered. Emergent left heart catheterization and selective coronary angiography revealed thrombotic 90% occlusion of the mid left anterior descending coronary artery. Balloon angioplasty and thombectomy were performed. A sirolimus eluting stent (3.0 × 33) was placed at maximum pressure of 10 atmospheres across the lesion. Angiography after stent deployment showed complete expansion of the stent with grade 3 TIMI flow, without proximal or distal edge dissections or any residual stenosis. The patient received intravenous abciximab bolus and infusion therapy for 12 hours and had an uneventful hospital course. Subsequently, the patient had been strictly compliant with dual antiplatelet therapy of aspirin and clopidogrel. However about three weeks prior to this admission (2009), he had two mild episodes of angina on exertion. A persantine-technetium 99 myocardial perfusion imaging stress test carried out was interpreted as positive for anterior wall reversible ischemia. Few days later, he presented to our hospital with sudden onset chest tightness and an EKG showing ST-segment elevation in leads V1-2. Emergent coronary angiography revealed a filling defect with 100% occlusion in the mid segment of the previous LAD stent with TIMI-0 flow, consistent with in-stent thrombosis along with significant proximal in-stent restenosis (Figure 1). Intravenous bivalirudin and eptifibatide were administered. Balloon angioplasty was performed at the in-stent thrombosis site. 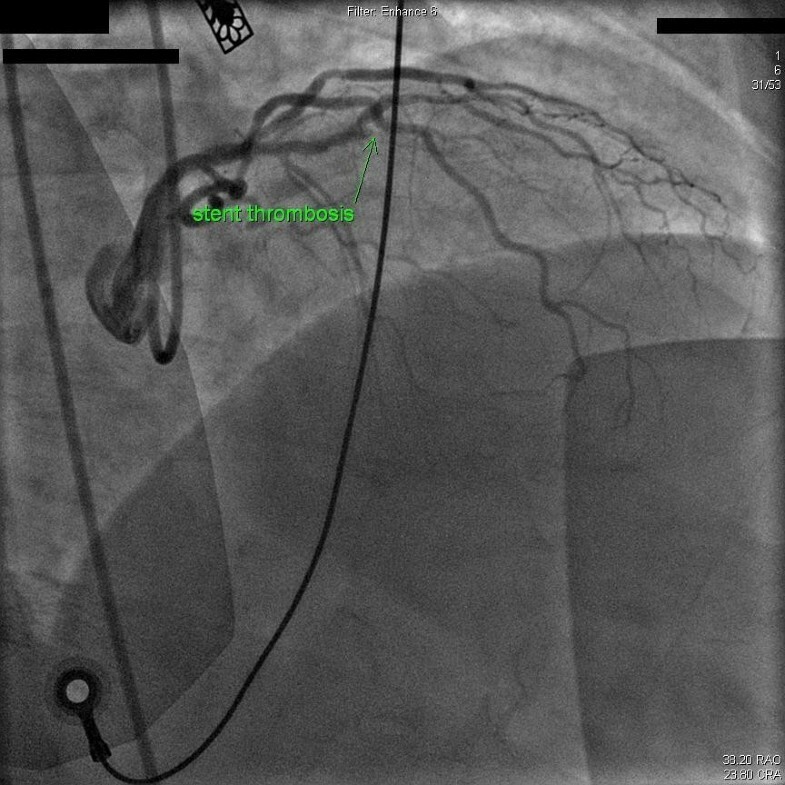 An Everolimus RX stent (3.0 × 15) was placed across the lesion resulting in 0% residual stenosis. 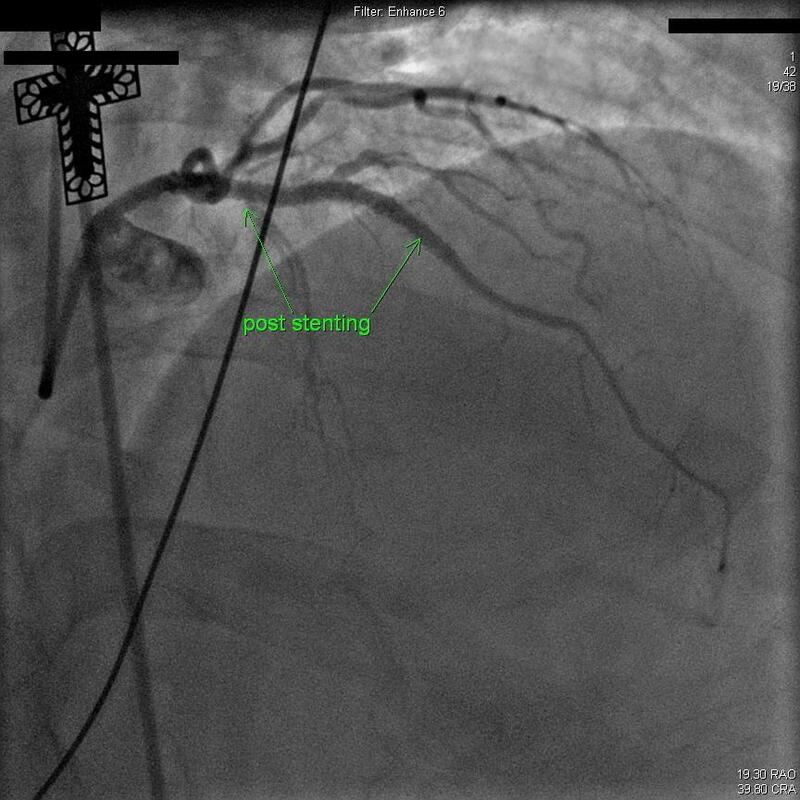 Another Everolimus RX stent (3.0 × 23) was deployed at the proximal edge of the previous stent and a smaller Everolimus RX stent (3.0 × 8) was deployed in an 80% de-novo lesion leaving no residual stenosis (Figure 2). Peak plasma troponin level was 60.05 ng/ml. A transthoracic echocardiogram performed after 48 hours showed mild hypokinesis of anterior wall of the left ventricle, an estimated ejection fraction of 45%. After 3 days of hospitalization patient was discharged on daily medications of aspirin 325 mg daily and clopidogrel 75 mg daily, atorvastatin 80 mg, isosorbide mononitrate 30 mg daily, atenolol 50 mg daily and lisinopril 20 mg daily. Angiographic evidence of in-stent thrombosis in the mid-segment of previous LAD stent. Angiographic evidence of blood flow (TIMI-3) in the mid-LAD segment post stenting. Stent thrombosis (ST) is classified by Academic Research Consortium into four types based on the time of event as; Acute: within 24 hours, Subacute: 24 hours to 30 days, Late: after 30 days, and very late: after 12 months. The consequences of ST could be catastrophic with a mortality rate of 45%, with the majority of others suffering nonfatal myocardial infarction [6, 7]. Angioscopic and optical coherence tomography studies have shown that lack of complete endothelialization of DES to be the most important predictor of LST [8, 9]. Virmani et al have confirmed the same mechanism using human pathological data . Risk factors for LST include patient and lesion characteristics, non-compliance of anti-platelet drugs and procedural factors like incomplete stent apposition, number and the length of stents, coronary dissection, etc. . It has been reported that the risk of stent thrombosis up to 4 years is significantly higher if the DES was placed during ACS . In the setting of myocardial infarction, underlying plaque morphology may affect the rate of healing, when stent struts penetrate deeply into a necrotic core and are not in contact with cellular areas, which impairs stent endothelialization . A large thrombus burden in the setting of ST-segment elevation myocardial infarction is a risk factor for future stent thrombosis . Hypercholesterolemia has recently been shown to cause endothelial progenitor cell dysfunction, thus contributing to the delay in endothelial healing, adding to the significance of statin therapy after PCI . There is consensus among cardiologists that stent endothelialization starts from the edges towards the center of the stent, leaving the middle portion of the stent to be the last to be covered by endothelium and usually the most likely site for LST . The same authors reported LST to be associated with diffuse in stent re-stenosis. The following factors could have contributed to the development of in-stent thrombosis in our patient: long stent [33 mm in length], history of hypercholesterolemia, implantation of DES emergently during ST-segment myocardial infarction with high thrombus burden necessitating rheolytic thrombectomy and the presence of in-stent re-stenosis. The 2007 ACC/AHA/SCAI focused update of the 2005 guidelines on PCI recommended dual antiplatelet therapy with aspirin and a theinopyridine for at least 12 months after DES implantation. Recent reports of very late in-stent thrombosis of DES long years after implantation represent a growing evidence to continue dual antiplatelet therapy for a longer period of time, perhaps indefinitely given the devastating consequences of in-stent thrombosis. A retrospective observational trial has suggested that triple antiplatelet therapy using aspirin, clopidogrel and cilostazol may further reduce the risk of stent thrombosis especially in patients or lesions at increased risk with no difference in the rate of major bleeding . The advent of prasugrel as a more potent platelet inhibitor compared to clopidrogrel may decrease the long term adverse cardiovascular events . Finally, this case highlights the need of further long-term studies on the occurrence of very late in-stent restenosis in patients treated with DES, both as an independent factor, and as predisposing to very late stent thrombosis. Written informed consent was obtained from the patient's next of kin/family for publication of this case report. A copy of the written consent is available for review by the Editor-in-Chief of this journal. TN is the major contributor to the case presentation of the manuscript and conducted literature review. MZ is the major contributor to the Discussion section of the manuscript and was involved in direct patient care of the patient. GJ and SG were involved in direct patient care. DB and RB were the reviewing cardiologists. SD is the interventional cardiologist directly involved in patient care.